Are Independents Just Partisans In Disguise? : It's All Politics Psychology explains why people don't always do what they intend to do. Can it explain why many independents vote along partisan lines? Independent voters have grown in recent years into a mega voting bloc. By some estimates they outnumber registered Republicans, and even registered Democrats. Every election cycle, independents generate enormous amounts of interest as candidates, pollsters and the media probe their feelings. These voters are widely considered to hold the key to most elections. 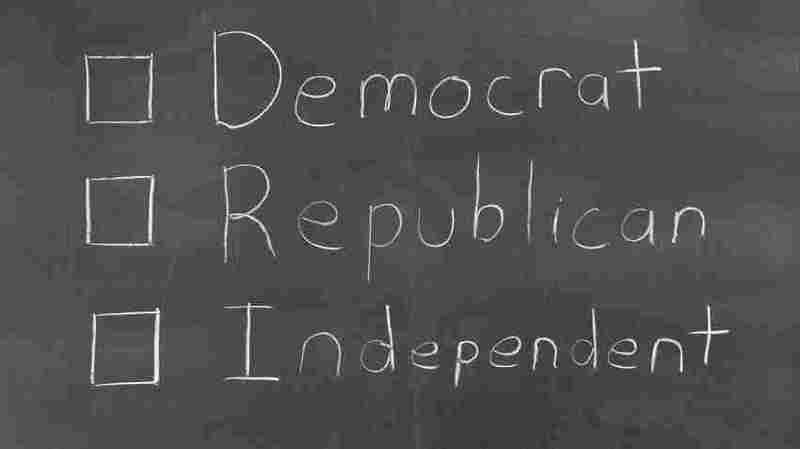 Independents generally report that neither party fully represents their views. Some report being to the left of the Democratic Party or to the right of the GOP, but most report being in the middle and describe themselves as moderates. As a group, independents tend to prize their ability to think for themselves, rather than march lockstep with a party. "It's a shame that ... more people don't do that," said Amin Sadri, 23, a Florida independent. "That more people, for lack of a better word, they almost feed at the trough. They are set on a certain mindset, so they only listen and gather information that is already predestined to go in a certain direction." Sadri is an independent voter. He despises partisanship, and has close friends who are Republicans and Democrats. Even his religion — he subscribes to the Baha'i faith — has explicit rules about partisanship. "It's an inherent aspect of politics that it's about one side versus the other," Sadri said in an interview. "So Baha'is, because we seek unity and because we seek to abstain from conflict and contention, partisan politics are something that Baha'is are forbidden to participate in." There's a paradox, however: Even as the number of independents in the United States has soared, presidential election after presidential election in recent years has come down to the wire. If a third of the country is truly open-minded about supporting either the Republican or the Democrat for president, the math alone suggests elections should regularly produce outcomes other than a 50-50 split. Political scientists have known for some time that significant numbers of independents vote consistently for Democrats or consistently for Republicans. Sadri for example, supported Barack Obama in the 2008 election and plans to do so again in 2012. Going back to the presidential race between Republican Bob Dole and Democrat Bill Clinton in 1996 — when Sadri was a small child — the disputed 2000 race between Democrat Al Gore and Republican George W. Bush, and the 2004 election between Bush and Democrat John Kerry, Sadri said he has always wanted the Democrat to win. So why isn't he a registered Democrat? "See, that's the problem," he said. "As soon as I say that I'm a Democrat, people look at me and say, 'Oh, you believe in this, you believe in this, you believe in this,' and I don't!" This fall, Sadri will count himself as an independent voter. But if the campaigns think he's persuadable, they'll be wasting their time. Now, politicians, reporters and pollsters have known for a while that only a few independents are actually open to persuasion. The challenge lies in how to identify them. That's where a new psychological test could be useful. Brian Nosek is a psychologist at the University of Virginia. Along with graduate student Carlee Beth Hawkins, Nosek studies why people don't always do what they say they want to do — why there is a gap in many aspects of human behavior between what people intend to do and what they actually do. Nosek and Hawkins believed this disconnect explains why many independents aren't independent when it comes to voting. The psychologists used a test that purports to measure people's inner attitudes, including ones they don't know they have. "The test is called the Implicit Association Test," Nosek said. "And it's been used for a variety of different topics — trying to measure people's racial attitudes, their anxieties about spiders, their self-esteem. In our case, we tried to measure how strongly people associate themselves with Democrats or Republicans." The speed of those associations can be precisely measured. In the study, Nosek tested 1,865 U.S. citizens to see how fast they made these associations. The test easily identified registered Republicans and Democrats. Republicans were quick to link Republican words with themselves. Liberals made faster associations with words connected to the Democratic Party. Independents? Some showed no bias for either party. But many did. "It might break down into a third, a third, a third," Nosek said, referring to independents who leaned Democratic, leaned Republican and were neutral. "There are a large number of independents who are not in the middle, but show some degree of implicit partisanship." Nosek and Hawkins proved the test was measuring people's real attitudes by asking the volunteers to evaluate different policies. Some were labeled Democratic ideas. Others were labeled Republican. Then Nosek secretly switched the labels. The idea that used to be called Democratic was now labeled Republican, and the idea that used to be Republican was now labeled Democratic. "What we found was that independents who were implicitly Democratic tended to favor the plan proposed by Democrats," Nosek said. "And independents who were implicitly Republican tended to favor the plan proposed by Republicans. And it didn't matter which plan was which." When a plan was labeled Democratic, in other words, independents who were implicitly Democratic supported it — and they opposed it when the label was changed to Republican. Party labels, not ideas, determined which proposals these voters supported. That's the definition of partisanship — where loyalty to the team comes first; the ideas come second. The psychologists are publishing their study in the journal Personality and Social Psychology Bulletin. Nosek thinks the test can help independents figure out if they are walking the walk, or just talking the talk. Campaigns might use the test to find the minority of independents truly open to persuasion. So this fall, don't be surprised if someone comes up to you and says, "Would you mind taking a little psychological test?"